Beneath the latest neat international narrative of a democratizing Ethiopia lies a ruthless struggle among competing domestic plotlines. Ethiopia has a narrative problem both abroad and at home. An ancient nation that defies simple categorization is often distilled into bite-size packages to provide instant hits but no lasting satisfaction. Meanwhile, domestic competitors present edited versions of a complex past to promote their visions of the future. After Live Aid in the 1980s, Ethiopia was known in the West as famine-stricken, to understandable local fury. The demeaning stereotype ignored that a climatically-diverse country was also tagged as the ‘water tower of Africa’. Next, amid the West’s post-Cold War hubris, Prime Minister Meles Zenawi’s government was presented as part of a new shiny democratic Africa. Those dreams were disturbed in 1998 when conflict broke out with Eritrea, and shattered in 2005 when elections descended into bloodshed. That meant it was time for a reboot. “From the ashes of that debacle a new image emerged: of the leader as a technocratic, if dictatorial, leader who had been able to crack the code of east Asia’s rise and download it into an Ethiopian hardware,” scathed journalist Abiye Teklemariam in 2011 about the international pivot on Meles. For half a decade, a narrative of “double-digit” state-led growth displaced democracy—until the people re-emerged in 2015. Now, following upheaval, a democratic transformation is under way, or so we are informed. As with most narratives, such as Ethiopia’s claim to be a cradle of humankind, there are factual foundations to the latest. But convenient, compact stories can serve to cloud more than clarify. This is a danger now, as democratization headlines mask turmoil and long-festering disputes, and a host of liberated elements use the opening to try and impress their vision of Ethiopia upon fellow citizens. Last year, Prime Minister Abiy Ahmed dismantled an authoritarian order through a wide-ranging amnesty, restructuring security institutions, and prosecuting officials. That was critical: a conflict between a national security state and increasingly emboldened protesters threatened to degenerate into civil war. With this major task undertaken, Abiy was confronted with the monumental challenge of encouraging political expression by starkly opposed elements, while also forging a new democratic consensus. There are two key conundrums facing the Prime Minister, who is also chairperson of the Oromo Democratic Party (ODP) and the ruling Ethiopian People’s Revolutionary Democratic Front (EPRDF), which equally shares decision-making among ruling parties from four unequally sized regions. The first is that despite leading the EPRDF, his stated mission is to reduce its power by making it one among many in a multi-party democracy after elections due next year. Hitherto, the EPRDF has run a de facto one-party state. So, how can power be shared in free elections, while ensuring the EPRDF, and Abiy, retain the reins? Additionally, EPRDF’s grasp glued together a multinational federation. If that relaxes, will the federation come unstuck? Talk of Africa’s Yugoslavia is in the air. The second is that ODP’s rise to become the most powerful EPRDF party followed mass protests in Oromia that demanded not just democracy, but autonomy. Abiy’s popularity stems from positioning himself as a leader for all Ethiopians, yet the Oromo resistance movement facilitated his ascendance, and so he also has to deliver for his base. Of course, those twin demands are not necessarily irreconcilable, but it is tricky territory, as can be seen from a vitriolic debate over Addis Ababa—or, for many Oromo, Finfinnee. The initial rallying point for protesters was that Oromo farmers would lose out as the capital grew under a master plan. These concerns built on grievances—some would say a victim narrative—that Oromo were displaced when Addis Ababa was built in the late 19th Century. In the EPRDF era, a self-governing Oromia was created, and the constitution also promised it a “special interest” in the city that is both the capital of the region and the federation. This could entail, for example, joint administration and revenue sharing. Or compensating Oromia for dealing with Addis Ababa’s waste, and promoting the Oromo language. The problem with such piecemeal measures is that they have not been implemented, and that they are up against more alluring, sweeping agendas. Some activists from Ethiopia’s most populous group argue Oromia should administer Finfinnee, while opponents claim ‘Oromization’ of Addis Ababa is underway, and vehemently object to the ODP mayor. Due to general disarray, elections for the city council that were due in 2018 will again not be held this year, as is the case with a highly sensitive census. So far, Abiy has maintained a big tent, but it will be impossible to mollify all parties in a polarized debate inflamed by social media, which has already bred violence. His hand is not improved by the fact that the ODP faces a challenge from the more hardline Oromo Liberation Front, which returned from exile last year. Liberalization brings complications. Still, there are plenty of potential compromises over the capital and among Oromo factions. That is not necessarily the case with the EPRDF’s travails, and the differing visions of Ethiopia’s constitutional future. The formerly dominant Tigray People’s Liberation Front (TPLF) has not implemented a federal arrest warrant for the ex-national intelligence head, a politburo member of the party, and rejected a commission on internal border disputes. It is arguably closer to conflict than forming a united front with it sister EPRDF party in Amhara state; it presents an obstacle to normalization with Eritrea; and the former rebel movement says it is prepared to struggle to defend the multinational federation. In Amhara, there has been a rise in ethno-nationalism, as seen in the surging National Movement of Amhara (NaMA). That movement has contributed to the EPRDF’s Amhara Democratic Party making claims on Tigrayan territory that are fueling those tensions. ADP will likely maintain the approach, otherwise voters may opt for NaMA. That movement presents the Amhara as recently downtrodden after playing the key role in a glorious Ethiopian past where the imperial line supposedly led back to King Solomon of the Old Testament. That mythical version of history is diametrically opposed to Oromo activist portrayals of Amhara-led Abyssinian imperialism. In the multi-ethnic Southern Nations region, the ruling EPRDF party has lost authority, as the Sidama community, and others, make constitutional claims to their own regional states. The increasingly brittle region is also experiencing multiple violence-laced identity-based autonomy demands, partly driven by desires to control budgets and appointments, as well as resource-based conflicts. Given the divisions and incoherence, Abiy seems to realize the old EPRDF is dead, and is planning accordingly. His intention appears to be to unify and expand the front by bringing into the fold five ruling parties from the other regions, which mostly have leaders that back his agenda. The TPLF may baulk, but that may well lead to its further isolation. Such general manoeuvring is possibly a necessary part of change, but it is not clear it will end EPRDF dominance: if Abiy successfully rejigs the front, an overwhelming election victory may ensue, given his popularity, the incumbency advantage, and a disorganized opposition. This would cause consternation among some returned opponents currently basking in Abiy’s reforming glow. Their narrative is that a federation structured along ethno-linguistic lines is the root cause of communal strife that has forced over two million Ethiopian from their homes. If another thumping EPRDF victory looks on the cards, they may well not be satisfied with Abiy’s suggestion that ‘ethnic federalism’ will be addressed after the polls. Regardless, there is indeed plenty to be positive about in Abiy’s Ethiopia, and elections could prove transformative, if the opposition mobilizes, the EPRDF allows an open contest, and civil society and media grasp newfound freedoms to explain, interrogate, and expose. Bottom line: Beneath the latest neat international narrative of a democratizing Ethiopia lies a ruthless struggle among competing domestic plotlines. 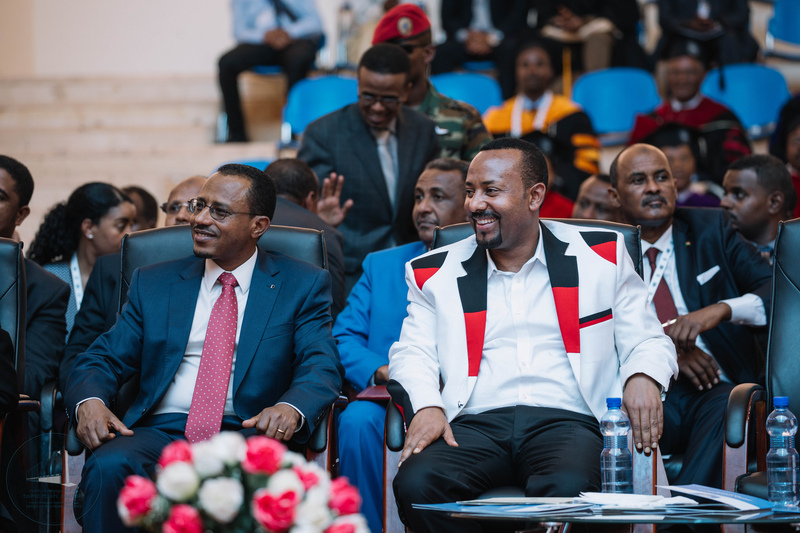 It is only by successfully somehow weaving these together that progress towards peaceful and prosperous pluralism can be achieved—and that this chapter of Ethiopia’s long and turbulent story will truly start to portend a fairy-tale future.